After my Monday post on the Naples 45 2pm Pizza deal, I got a lot of questions about other late lunch specials in Midtown. If you can wait until after 2pm, there are countless deals to be had by restaurants looking to pick up their afternoon business, or unload their lunch stuff before the deadness of Midtown dinner. Like I said before, I’m pretty ill-equiped to answer this one. It’s a miracle if I even make it to 12:30pm before eating lunch (nevermind getting to 2pm or later). So I’m going to need your help… If you know of a late lunch special, post it as a comment below. Ho Yip (45th btw. 5+6th) – After 2:15pm, the price of the by the lb. buffet at this Chinese place drops to $3.75. Naples 45 (45th btw. 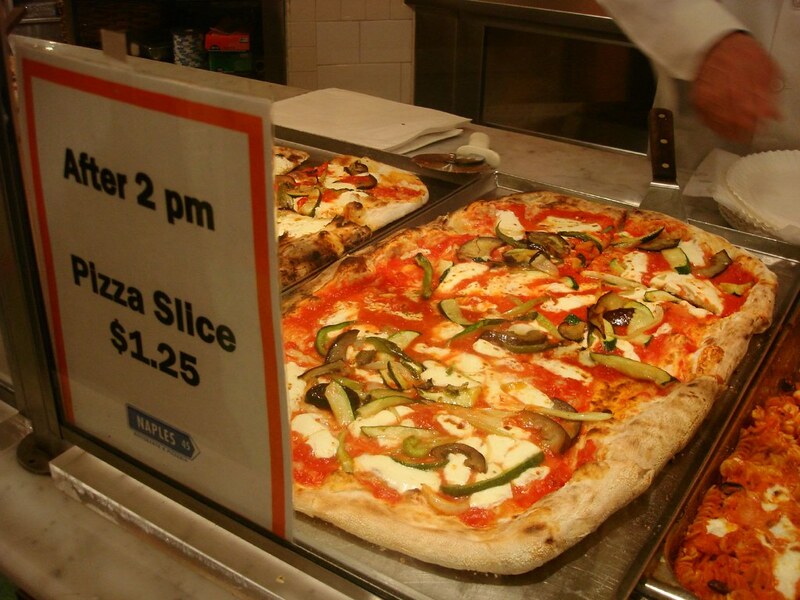 Lex+Vanderbilt) – After 2pm, the price of all pizza drops to $1.25 a slice. Cucina & Co. (Multiple Locations) – It’s different for every location, but Cucina drops the prices of a lot of their items at different times. I posted a list in August, but I’m not sure if it’s valid anymore. I guess it’s not surprising, but these places are owned by the same company that owns Naples 45. There also was a late sushi special at Pranza, but apparently that doesn’t exist anymore. I think early bird specials are more my thing. If getting somewhere before Noon got you a deal, I would be all over it! The only one of those I know about is Men Kui Tei (on 56th btw. 5+6th) which has a special set menu or Gyoza for super cheap before 12:15pm. Do you know of a late lunch special in Midtown Manhattan? (Or an early special for that matter…) Post it as a comment below. Posted by Zach at 7:38 am, April 11th, 2007 under Deals. doesn’t Fashion Soup have an after-2pm special? I think after 3 or so at 19 Metro (19 w 45th) they have all premade sandwiches $4. I also long for the days when BK on 46th (now closed) had the $2 whopper after 4pm. also, chiyoda sushi on 41st st has specials on their bento boxes later in the day. i don’t think there’s a definite time of day when they mark them down, but i think its half price. kinda late, but after 5pm, Yummy sushi in Rock Center concourse has prepackaged sushi for 50% off. The NBC PAs (production assistants) are all over this one every day. cucina in gct has 25% off some baked goods after 3. and I think a 3 for $1 cookie deal? question- anywhere to get huevos rancheros? Either breakfast or lunch is ok.
Doesn’t Pret-a-manger (sp?) have an after 5:00 special on sandwiches? cucina in rock center is 1/2 price after 4pm on all baked goods, hot plates, soups, salad bar, packaged salads, smoothies, etc. it gets packed around 3:50 and they won’t ring you up for 1/2 price until it hits 4:00pm on the dot, so the line gets kinda long. if you’re patient, you can get great deals (e.g. a 1/2 rotisserie chicken, mashed potatoes/gravy for $4.75). mangia on 48th between mad and 5th marks down their food at 4pm. Good for lunch if you work the night shift!! Also good for treat on the way home. Chop’t throws in an extra topping for free before noon. the cheese is great at Naples 45- these people take pizza seriously!!! One of the best Midtown Lunch specials is the Dallas BBQ early bird special. For $9.99 you get two FULL MEALS. 2 Chicken Vegetable Soups, 2 rotisserie HALF chicken, cornbread, and a choice of a side. Bring a friend, and it’s like $5 a person for all that! Best deal in Manhattan, I’d say.